Mash-ups reuse, repurpose and combine existing data, art or content to create something new, or add value in some way. We encourage users to mash-up OpenGeoscience material with their own data in new and innovative ways by adding new functionality or interfaces. We can draw inspiration and know-how from mash-ups from the developer community to help us develop robust new products for the benefit of society. Contact us if you create something new and innovative that could benefit others. ArcGIS Explorer, ArcGIS Server, ArcWatch, Google Maps, KML, MapInfo and Ordnance Survey OpenSpace. Herefordshire & Worcestershire Earth Heritage Trust are recording, cataloguing and untangling the history of stone use in heritage buildings across Herefordshire and Worcestershire. From cottages to castles and from bridges to barns the stone built heritage of the region has, through the ages, represented an important link between the largely hidden world beneath our feet and our everyday lives. Includes BGS geology WMS services. Awila by Augmented Technologies Ltd is a new way to visualise location based information on the move, utilising Augmented Reality. BGS geology maps, along with data from other sources, are painted on the ground as you look through your phone's camera. Combining BGS geology with cave information and Google Maps in the Mendips area. Explore your planet as never before with the mobility of EarthObserver by Columbia University. Use your fingertips to travel through terrestrial landscapes and across the ocean floor. Visit frozen icecaps, study geological maps, scout mountains to climb and trips on coastal waters and exploit a rich atlas of other earth and environmental imagery. A free app by Mobeezio, Inc. that delivers live earthquake date to your phone using data from numerous services including the U.S. Geological Survey, GeoNet and the British Geological Survey among others. Investigate sinkholes that have started appearing around the UK as a result of heavy rainfall, by ESRI. Click and drag the spyglass viewer to see the underlying geology for each sinkhole. Open Data provided by the Environment Agency, Natural Resources Wales, BGS and the Met Office. 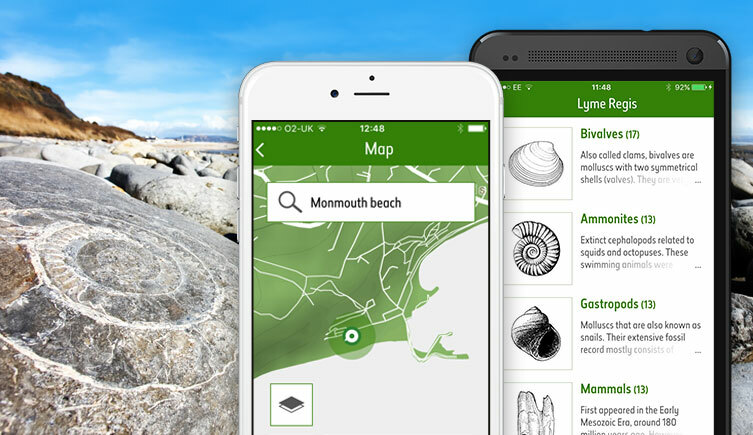 The Natural History Museum have used BGS data to create the Fossil explorer app where you can identify rocks in Britain based on the age of the rocks where the fossils are found. Beneath Your Feet is a service to make it easier to access the high-resolution geological maps published by BGS. This service provides an easy means of accessing maps for a particular location without needing to know the map number or title through location-based search or interactive map. The app by BrooksDesigns guides your walk along the Newent to Huntley section of the Abberley and Malvern Hills Geopark Way - a 109 mile walk running between Bridgnorth in Shropshire England to Gloucester Cathedral. The trail is divided into 17 sections and there will be an app for each section. Includes BGS geology WMS services. This app by Andrew Zolnai combines land cover data from H C Darby's publications, geographic data from the Ordnance Survey, geology data from BGS and coastline data from NGDC GSHHS to create a geographic history of land cover and surface geology of East Anglia since Domesday. Tlatet has combined BGS data with crowdsourced geographic data — OpenStreetMap. A reference guide by LateNightProjects to the latest magnitude 1.0 and larger earthquakes from around the world as provided by seven worldwide sources including the BGS, the US Geological Survey and the European-Mediterranean Seismological Centre. Find out when they happened, where they happened, how big they were, and more. All in an easy-to-use interface! An example of combining BGS geology data provided via WMS with Ordnance Survey OpenData (© Crown copyright and database right 2011) using QGIS by Nick Hopton. The Library manages the archive and official release of 2D and 3D seismic data recorded over landward areas of the UK. Its interactive map uses BGS geology web services to present background imagery. Maps up to the last 50 days worth of earthquakes in and around the UK, displaying location, magnitude and depth with links to more detailed information at the British Geological Survey by Ear to Ear Oak. "The BGS site is a good example of publishing the same content in a variety of different ways, for public users via a Web app, KML, and also the building block data so it can be used and combined with other data for further GIS use." ArcGIS Explorer Blog by ESRI. OneGeology is an international initiative of the geological surveys of the world. Its aim is to create dynamic digital geological map data for the world. BGS data is also available via the OneGeology-Europe partner project. The UK Soil Observatory (UKSO) provides a gateway to discover, view and download large-scale soils property datasets from across NERC research centres. It aims to bring together resources to improve our understanding of soils and to help answer key, policy led questions. Ready-made project and layer files for loading our street level 1:50 000 scale geology WMS web service into ArcGIS, MapInfo and Google Earth software. Combine it with other data at the click of a button. Combining our geological WMS services with Google Maps. This example uses our 1:625 000 scale data. View the source code to see how we did it. Opening geological maps to the world. Using the Geology of Britain web browser to explore how geological features appear on maps and how the formations are linked to relief features. Opengeoscience 1: igneous intrusions and lavas. Investigating the UK's geology using GIS, including a new lesson in the ArcLessons library Geologic Investigation of the UK with GIS which discusses how to use the resources made available in OpenGeoscience.